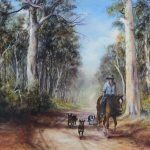 As far back as I can remember I had a pencil or a piece of charcoal in my hand and I was permanently drawing. 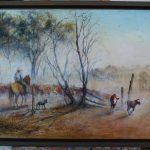 Progressing to oil paintings in my late teens, I’ve now been painting on and off for 30+ years. 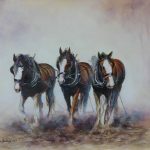 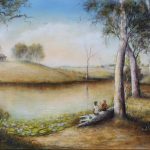 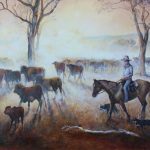 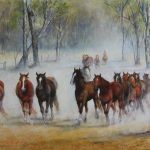 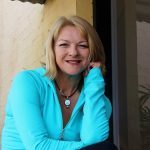 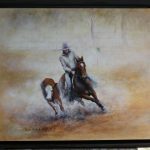 Whilst I am a versatile artist who is willing to try just about anything, I love to ‘tell the story’ of life on the land, and to portray the affinity that exists between man and horse. .
A country girl born and bred, I grew up on a cattle property in central Qld where my siblings and I even rode horses to school. 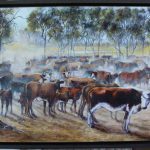 A harsh but good life, we kids grew up strong and capable, working beside our parents as we endured, amongst other things, crippling drought, and it’s this intimate firsthand knowledge of the bush that inspires my work. 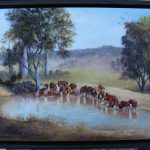 My father, also an artist, instilled in me a great appreciation for the land and all its creatures, I learnt to see its awesome beauty and understand and respect its harshness. 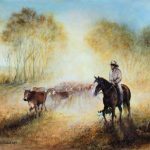 As far back as I can remember I had a pencil or a piece of charcoal in my hand and I was permanently drawing. 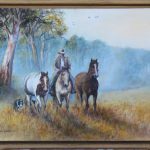 Progressing to oil paintings in my late teens, I’ve now been painting on and off for 30+ years. 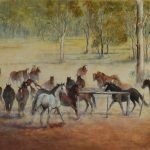 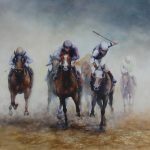 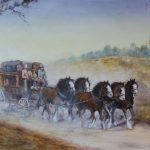 Whilst I am a versatile artist who is willing to try just about anything, I love to ‘tell the story’ of life on the land, and to portray the affinity that exists between man and horse. 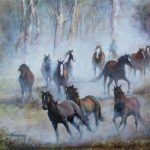 As an accomplished landscape and equine artist, I also love to turn favourite photographs into works of art, whether that be the old family homestead of yesteryear or that great polocrosse tournament action shot. 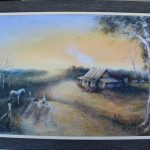 Whilst I paint boldly using a palette knife a lot of the time, I love to capture light in all its great glory. 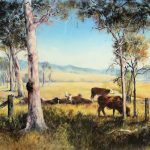 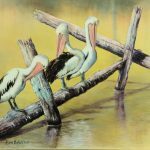 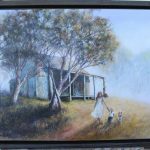 I’m often told it’s the uniqueness and authenticity of my work that stands out – you can only really paint the stories of the bush if you’ve lived those stories and I’ve certainly done that. 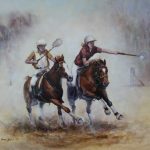 Polocrosse – That Left-handed Catch!